Nymph fly patterns represent the larval forms of aquatic insects usually caddis or mayfly or stone fly nymphs although chironomids or midge can feature to a lesser extent. The latter are much more dominant in still water bodies and evidently this site isn't concerned much with those. As with the dry flies there are those who tie and fish a variety of species specific nymph patterns and tie flies that are practically replicas of the natural insects. If you feel tying and using this type of realistic pattern will increase your chance of success then I am afraid you will have to look elsewhere on the net for them. I believe more strongly than ever that the greatest trigger for any nymph pattern is inherent movement and the impression of life. We even devised an experiment of super real flies versus a gold headed hares ear. Under every circumstance the gold heads hares ears out fished the super realistic patterns every time. Of course the implication here is not that natural nymphs look more like gold headed flies, or that there are natural hatches of gold heads and fish recognise them. Just that the trout find the gold headed flies more attractive. A combination of the bead head with the motile and translucent hares ear body was always more suggestive to the trout than rather than the rather rigid and "lifeless" replicas. Nymphs allow the fly fisher to enter the 3 dimensional world of the trout and there are a variety of fly fishing techniques that help the modern fly fisher to do that. They include the duo, Czech, Polish and French nymphing. Most of the modern European nymphing techniques require nymphs to be weighted to a lesser or greater extent. 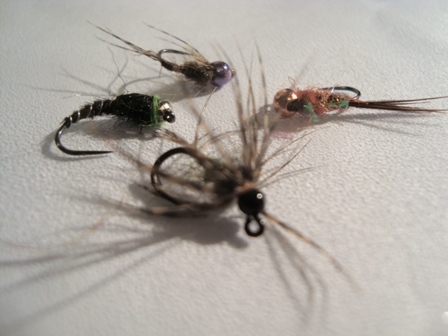 In fact bead headed flies of a variety of colours are now widely used even in modern techniques like Czech nymphing usually associated with "traditional" Czech nymphs. Click the link to see one tied by a Team World champion. 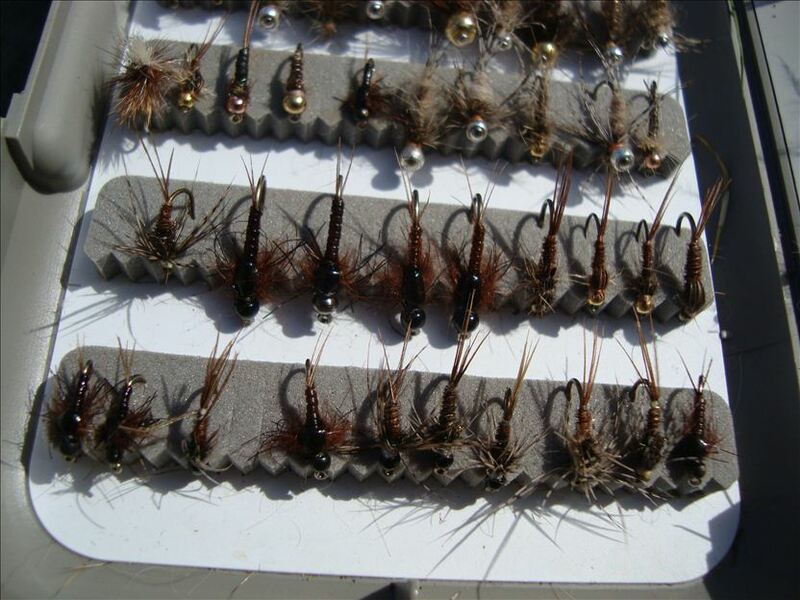 Many competition fly fishers use tungsten beaded nymphs because it gives them control of the depth and speed they fish at. Common sizes for tungsten beaded flies are between 2 mm and 5 mm. A 2 mm bead would be tied on a size 14-18 size hook and be used under a dry fly (see the deadly duo) or under an indicator. A 5mm tungsten beaded fly is rather heavy and would sink an indicator or a duo dry fly and would be used for Czech nymphing in heavy flow conditions. That isn't to say traditional nymph patterns like Sawyers Pheasant tail nymph are not effective. Sawyer was a great fly fisherman and I'm fortunate to know an older friend who fished with him. An anecdote he tells about Sawyer versus a trout is very interesting and addresses one of the central tenants of nymph fishing directly. Sawyer had spotted a good trout in a good lie and positioned himself heron like in the river. As my friend approached Sawyer pointed out the trout he intended to catch. However noted Sawyer- I will not catch him this time. Sawyer cast his line with perfection and the fly drifted perfectly over the wise old trout who remained unmoved. "Neither" repeated Sawyer "will I catch him this time and repeated the process drifting the pheasant tail nymph slightly to the side of the trout. "However" he pronounced "I will catch him on this occasion". As he said the words he cast as before and as the fly approached the trout he gave his rod tip the slightest of flicks. The fly darted a couple of inches and the trout took. Sawyer smiled as yet again his "induced" take had foiled the trout. Sawyer was imitating the small movements of a natural nymph. The trout was deceived by the movement in the fly and when applied by such a skilled practitioner as Sawyer there was only going to be one result. Sawyer had the advantage (some might say disadvantage) of fishing in clear water to sighted trout. Many don't have this advantage so we need a method of introducing natural movement into the fly. One way of achieving this is to wholeheartedly steal the ideas incorporated into North Country spider patterns and incorporate a soft hackle. The following video illustrates my current design of nymphs for European styles including Czech, Polish and French nymphing.